I really like the taste of homemade pasta, but the time and effort involved in making it usually makes it prohibitive. 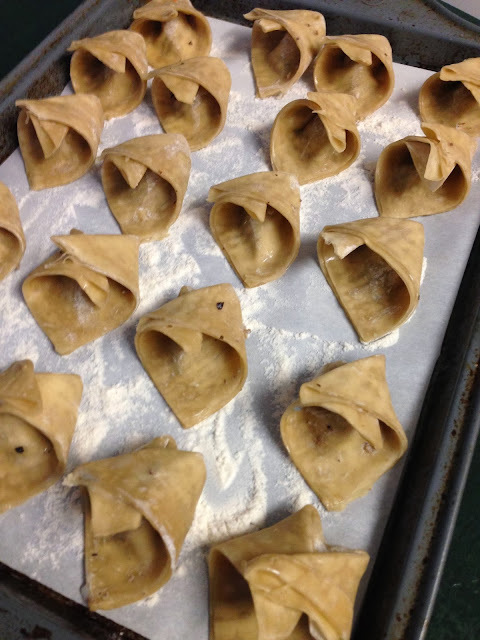 This recipe is for cheater's tortellini, which cuts out the step of making the pasta by using fresh Chinese wonton wrappers, and just leaves you with the step of making the filling. I really appreciate knowing exactly what has gone into my filling as well as the ability to be creative and make whatever combinations I want. 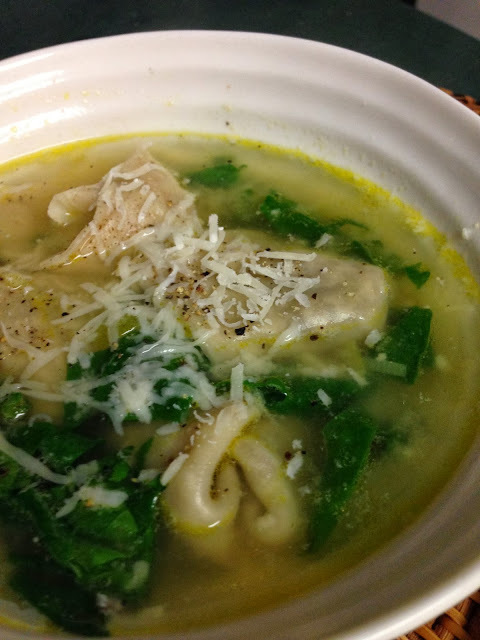 This week's recipe is really two recipes in one because you can serve the tortellini as pasta or in the soup, and you can also make the soup with store-bought pasta, if you prefer. Making it with store-bought pasta is a really fast way to whip up a simple soup for a weeknight supper. From this recipe you will get about 40 tortellini, and the soup will serve about 6 people. 1. 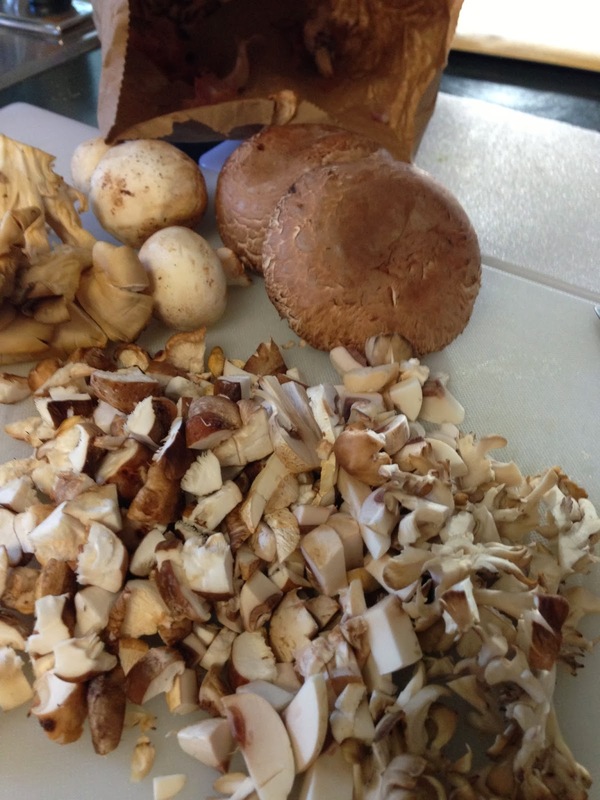 Cut the mushrooms into small pieces. 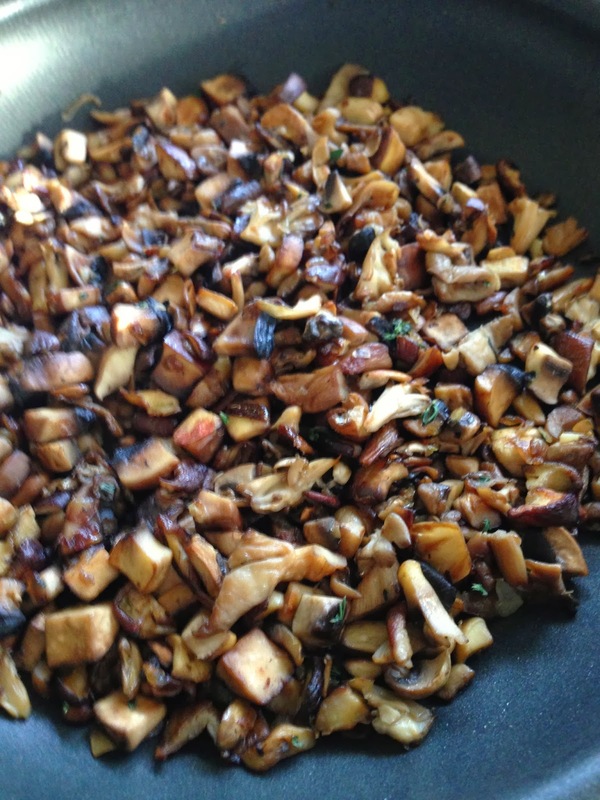 Saute the mushrooms and the shallots in the ollive oil in a large frying pan over medium high heat. 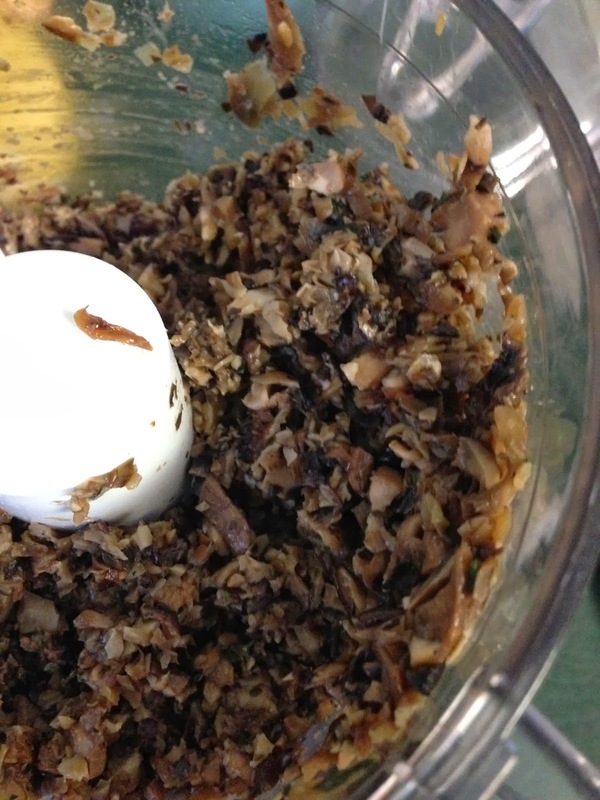 Do not add more oil, as the mushrooms will release some of their moisture and will not stick. If they do stick, add a few drops of water. Also, do not add salt at this point because you want the mushrooms to brown, not steam. If you add salt, it will draw the water out of the mushrooms. Once the mushrooms have enough colour (about 15-20 minutes), then add salt, pepper, and thyme leaves. 2. Cool the mushroom mixture and then either chop it finely in a food processor or cut it more finely with a knife. You don't want a paste, just very fine pieces. 3. Add the ricotta to the mushroom mixture. Add more salt and pepper as necessary. You will probably have to add quite a bit of salt as the ricotta does not have much. 3. In a small bowl, make an egg wash by whisking the egg with 1 Tbsp water. 4. On each wonton wrapper, use you finger to put a line of egg wash on two joining sides. 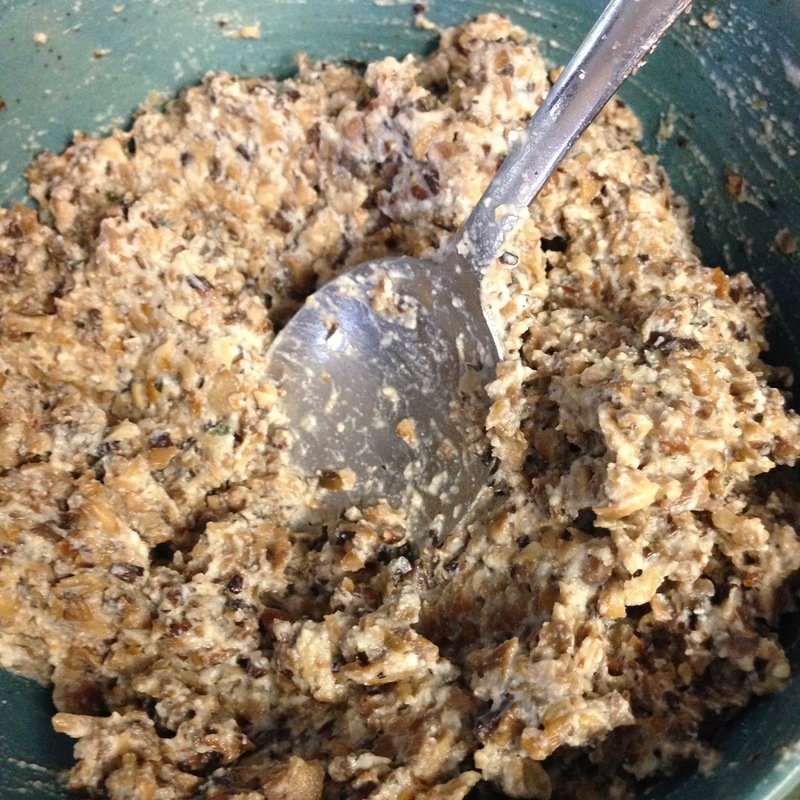 Then, put 1 tsp of mushroom mixture in the middle of the wrapper. Fold over the wrapper to make a triangle. 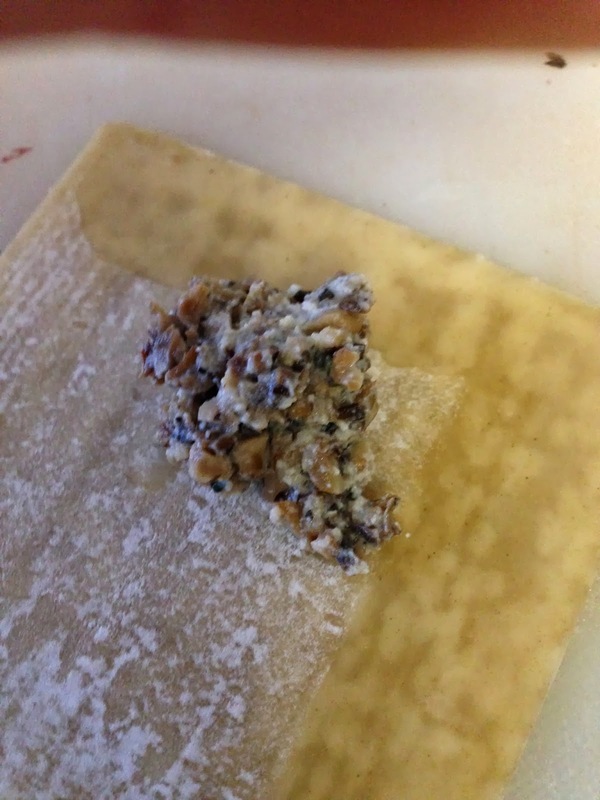 Put more egg wash on one corner of the wrapper and fold the opposite corner over top to make a tortellini shape. 5. Put the tortellini on a baking sheet dusted with flour to keep the tortellini from sticking to the sheet. You can freeze them on the sheet and then transfer to a plastic storage bag if you are not going to use them all at once. 1. In a large soup pot, saute the leek in olive oil and season with salt and pepper. 2. Add the chicken stock, miso, and tortellini, and cook for about 5 minutes or according to package directions. Add the spinach and basil and the end and stir until it wilts. 3. Taste for seasoning and serve the soup topped with freshly grated parmesan cheese. Enjoy! 1. If you are lucky enough to have a farmers market where you can buy fresh mixed mushrooms like I do, that is the best place to get a good mix that will taste delicious. 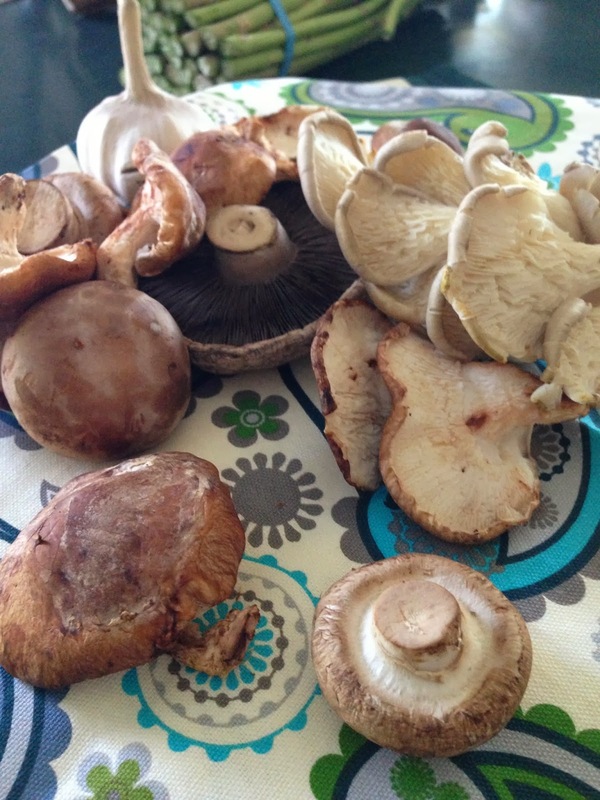 If not, you can buy a mix from the grocery store, or just use cremini mushrooms. Do not use button mushrooms because they do not have as much flavour, and they hold a lot of water, so it is difficult to brown them nicely. 2. If you can't find shallots, you can use finely chopped white onion. 3. You can use either regular or light ricotta cheese. You could even use goat's cheese, if you want. 4. Miso is a fermented soy bean product, is high in protein, and has many health benefits. I buy shiro miso and use it in many soup dishes. It is a subtle flavour, but it really rounds out the flavours in soup and gives it added depth. 1. There are a wide variety of options for the cheater's tortellini. Instead of mushroom, you can use roasted butternut squash, sauteed kale, or even roasted red peppers. You could also make the "pasta" into other shapes such as ravioli. 2. You could also add white beans to the soup to make it a more substantial meal. 3. Kale can always be substituted for the spinach. When I first made this recipe, I actually didn't have a lot of time, so I cooked the mushrooms while I was making another meal, and then froze them. 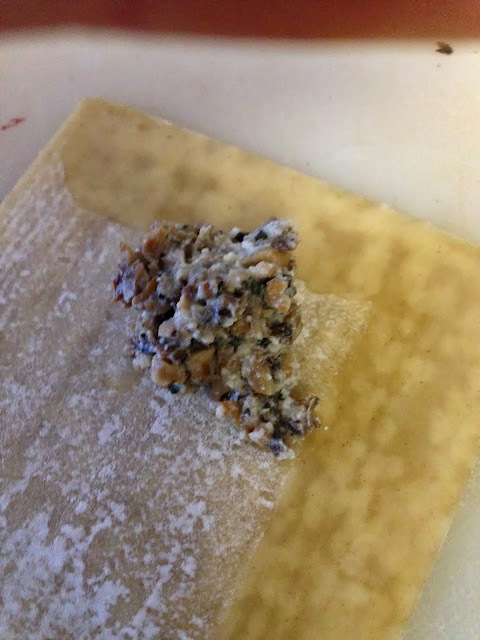 Another day, I made the mushroom/ricotta mixture and stuffed the tortellini, and then froze them. Finally, after an afternoon of raking leaves, I quickly threw together the soup together on the third day. 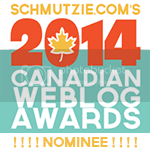 Welcome to the Edmonton Food Blogosphere! Enjoying your site! I would love to get your posts in my mailbox. Feedburner is one free app that you can download into your back end to enable others like me to do that - let me know if you do it, so I can sign up. Hi Valerie, Thanks for the welcome and thanks for the suggestion. I have do not have experience with Feedburner, but I think I have installed it properly. I hope that you are able to subscribe now! Thanks again for your support.